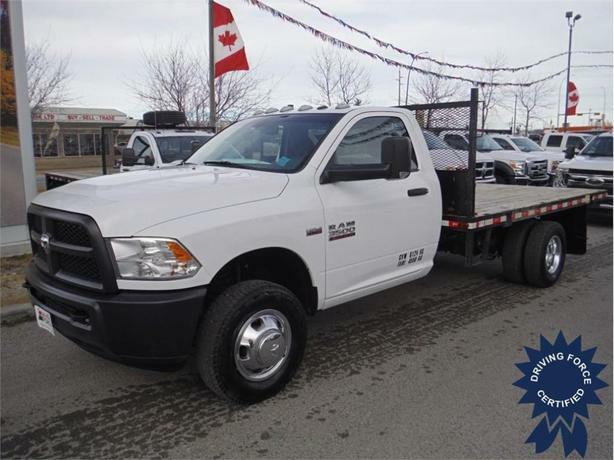 This 2015 Ram 3500 Regular Cab 4WD Flat Deck features a 12ft deck, powerful 6.4L Hemi V8, power door locks, power windows, easy clean vinyl floor, AUX upfitter switches, integrated trailer brake controller, Bluetooth hands-free calling, buggy whip, fire extinguisher mount, tilt, cruise, CVIP Commercial Inspection, balance of factory warranty and a fresh service. Call or email one of our knowledgeable fleet sales consultants in Calgary today and experience the DRIVING FORCE difference. At DRIVING FORCE Vehicle Rentals, Sales & Leasing we take care of our customers and make it easy to buy or lease a car, van, SUV, or truck. We have a large selection of quality, fully reconditioned pre-owned inventory available for purchase. Many of these vehicles are lease returns or buy backs with factory warranty. All prices include: a CarProof report, lien check, 120 point vehicle inspection, AMVIC inspection, and commercial inspection (when required), two sets of keys, an owner's manual, and a full tank of fuel. We will provide you with the reports and summary of repairs completed. In addition to the balance of factory warranty, all our vehicles are DRIVING FORCE CERTIFIED. Our 3 month or 5,000 kilometre warranty means the best value and quality for your next vehicle purchase. We offer a range of financing options, work directly with major banks, and offer both prime and non-prime solutions. Whether retail or commercial, we have the solutions to fit your needs best.